Well this week has definitely been a very big week. With the blessing of our first grandchild. We are so elated and he is so prefect. I will be doing layouts of him, however each week I do intend to do a layout from 2011. So this week I chose Greg and Hunter. Greg & Megan bought Hunter for David & I for Christmas however we got him in November as that's when he was ready to come. This photo is take from the day we got him in Bendigo. 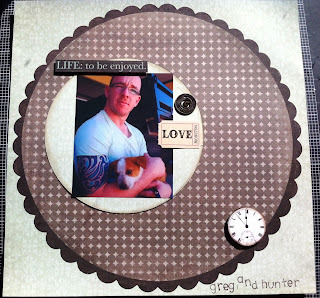 I love the little Tim Holtz muse token with the G and it says Genuine, which Greg so definitely is.